NorthEast United FC hosted FC Pune City in their last home game of the league stage in the Indian Super League. 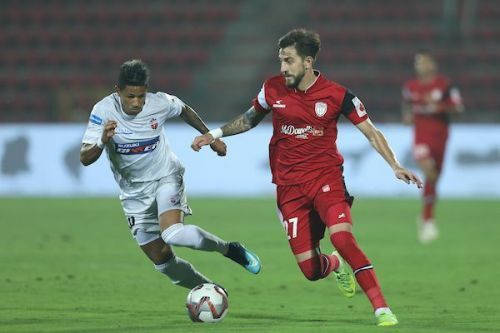 It was a crucial match for NorthEast United FC as a win would have ensured a spot for them in the playoffs for the first time in the history of the Indian Super League. FC Pune City has been on the rise lately, and it was no easy task for the Highlanders to get the better of FC Pune City. The match started on a bright note as both the side looked to play an attacking brand of football. The teams went into the half time break with the scores level at nil-nil. NorthEast United started the second half with all guns blazing and scored in the 47th minute to take the lead through a Rowllin Borges strike. Pune equalised in the 69th minute. The game ended 1-1. On that note let us take a look at the five talking points from the game. It was a game where ex-East Bengal coaches managed both the teams. Eelco Schattorie, the NorthEast United manager and Trevor Morgan the assistant manager of FC Pune City, were both at a point of time managers of East Bengal in the I-League. FC Pune City coach Phil Brown mentioned it very clear that Trevor Morgan has had a significant impact on the team and that his experience of coaching in India has been a huge plus point. Eelco’s impact on the league is there for everyone to see as he has managed to make NorthEast United FC the team with the lowest budget one of the best performing teams in the league. Both the coaches are known to be among the best coaches to have coached in India, and both prefer to play a creative brand of football. Both Eelco and Trevor Morgan are the oldest serving foreign coaches in top-level Indian football at the moment. The game lived up to its expectation of a livewire as both the teams showcased an attacking brand of football. The intent of both the sides was clear from the word go as both the teams wanted to leave the pitch with all three points.